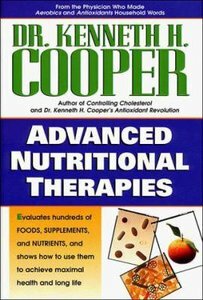 - Publisher Who better to decipher the barrage of nutritional information in today's media than Dr. Kenneth Cooper---the man who coined the term "aerobics"! Drawing on the very latest research, this best-selling author offers professional advice on nutritional and medical issues from A to Z. He covers over 100 subjects including alcohol, depression, folic acid, melatonin, and stress. - Publisher Following the enormous success of Dr. Kenneth H. Cooper's Antioxidant Revolution, Dr. Cooper now provides the ultimate nutrimedicine program for lifelong health, focusing on minerals, herbs, natural foods, supplements, and hormones. Who better to decipher the barrage of nutritional information in today's media than Dr. Kenneth Cooper---the man who coined the term "aerobics"! Drawing on the very latest research, this best-selling author offers professional advice on nutritional and medical issues from A to Z. He covers over 100 subjects including alcohol, depression, folic acid, melatonin, and stress. Following the enormous success of Dr. Kenneth H. Cooper's Antioxidant Revolution, Dr. Cooper now provides the ultimate nutrimedicine program for lifelong health, focusing on minerals, herbs, natural foods, supplements, and hormones.